Anyone else getting antsy for Spring?! Two weeks ago we had snow, and ever since it’s been gorgeous. I’m talking sun shining, windows open, temperatures above 70 gorgeous days! One of those beautiful mornings, my husband took the kids to the park so I could clean. Trust me when I say I got the cleaning done quick, because I wanted to surprise them with a Spring Break Breakfast Bar when they came home. Fresh Flowers and Breakfast Bar Signage are optional but who doesn’t love smellling fresh flowers?! For this Spring Break Breakfast Bar, a light green table cloth, purple plates, turquoise silverware, and polka dot napkins really said SPRING! Add to that a mini mason jar with fresh flowers and you can’t help but hear birds chirping. Yes, I taped napkins around the syrup, and it was a two second “decoration” that looked fabulous, lol! Offer a couple different syrups if you can, including a plain syrup. My son loves to mix ALL the syrups together. He swears it tastes good, but I will stick to one for now. What about you? 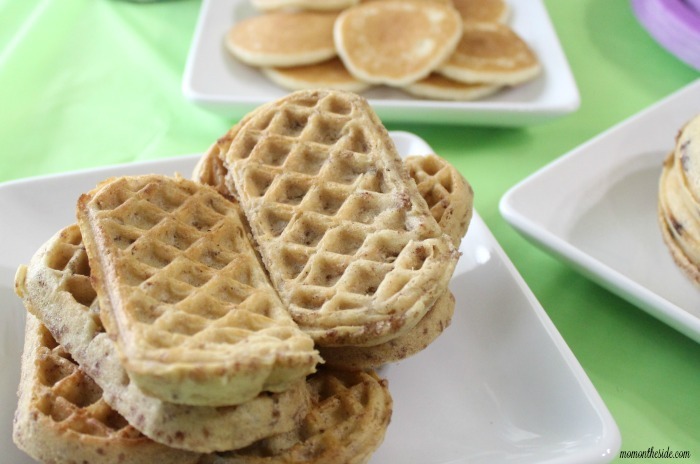 Serving a variety of Eggo products make this breakfast bar extra delicious. The twins went for the Eggo Mini Pancakes first, as to be expected. 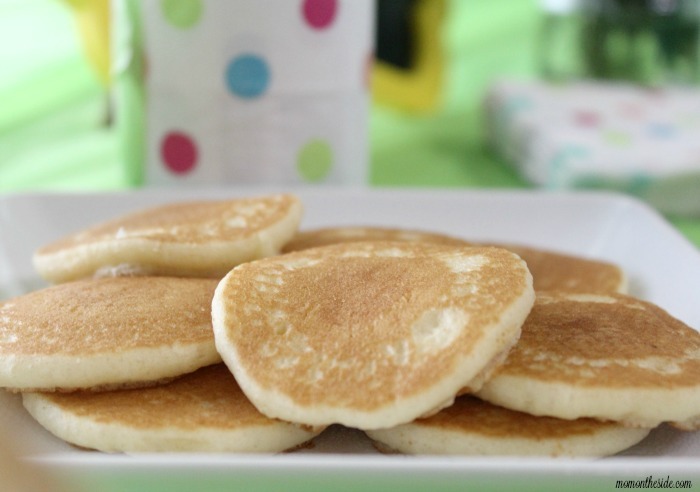 Their love for pancakes takes it beyond breakfast and brinner. They could eat them anytime and these microwave in seconds so I can make them anytime. Another great thing about being able to microwave Eggo Mini Pancakes is, toasting Eggo Brown Sugar Cinnamon Roll Wafflers can be done at the same time. Large family here, so a four slice toaster is a must, and I would have a six slice if I could! 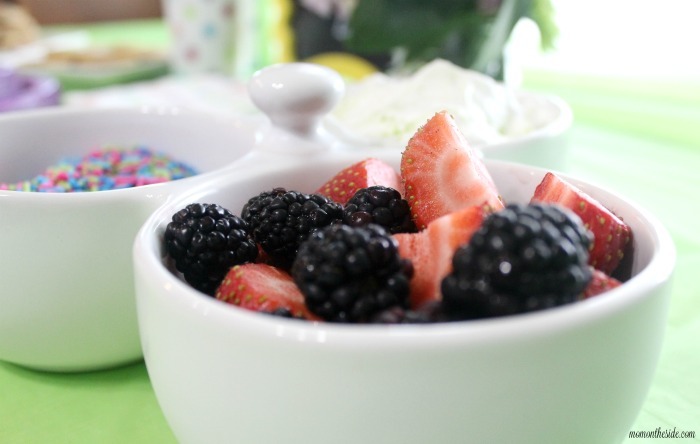 Toppings like spring colored sprinkles, fresh berries, and whipped topping mixed with sugar crystals are great for this breakfast bar. If you haven’t tried fresh fruit and whipped topping on your waffles, I highly recommend it. 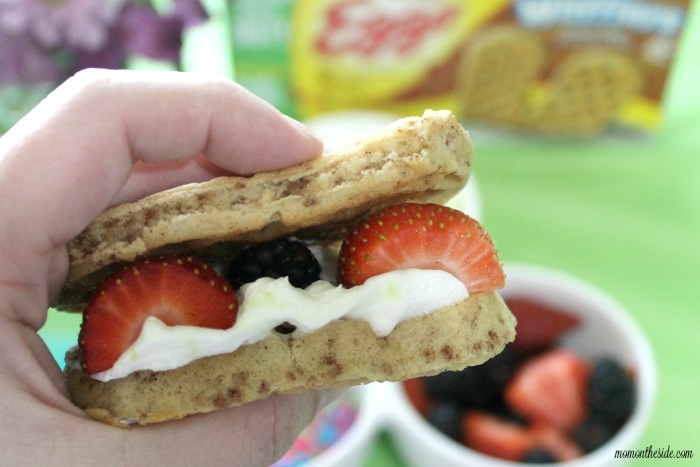 Speaking of that fruit and whipped cream combination, try a Eggo Brown Sugar Cinnamon Roll Waffler Sandwich! A scoop of whipped cream, a few fresh berries and you have something you can eat for any meal. 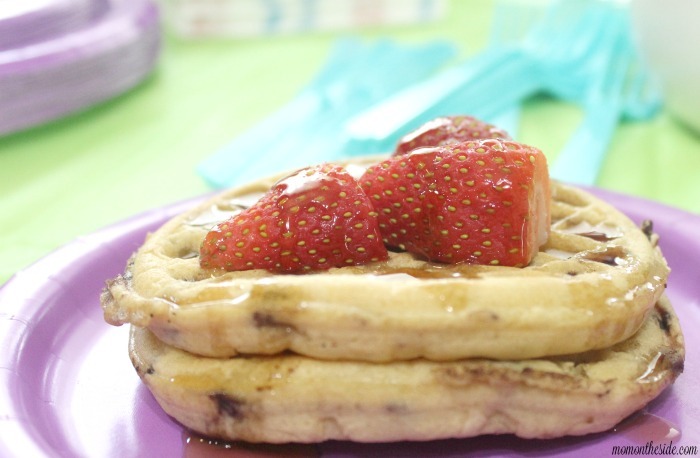 Eggo can be versatile and isn’t just for breakfast, as this deliciousness shows. Endless creative possibilities are what you get when it comes to making mealtime, snack time or anytime fun with Eggo products. If whipped topping isn’t your thing, fresh strawberries and syrup are also yummy! My teen daughter always chooses Eggo Chocolate Chip Waffles over any other flavor. What flavors do your kids love? 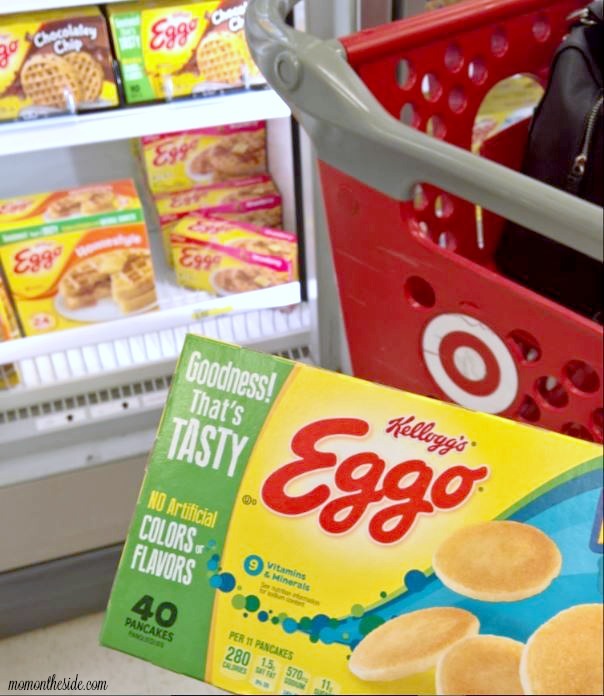 No matter what flavor it is, all Eggo products have a new formulation that is free from artificials. 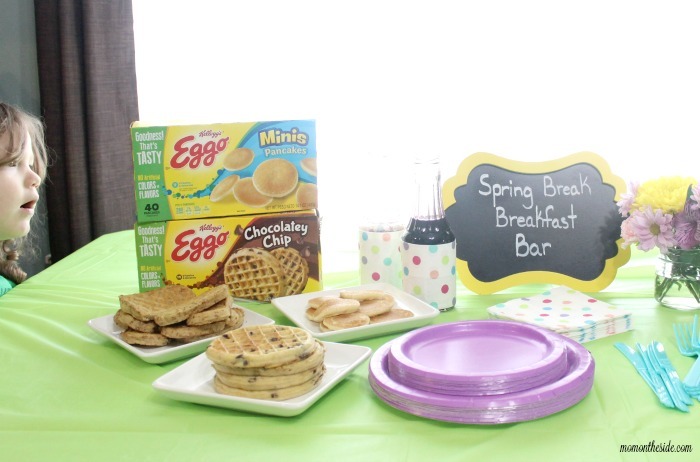 Stock up for this Spring Break Breakfast Bar at Target, with Eggo Products on sale for $1.99 right now! Eggo is now made with ‘No Artificial Flavors. Colors from Natural Sources.’ Look for the packaging with the green banner! 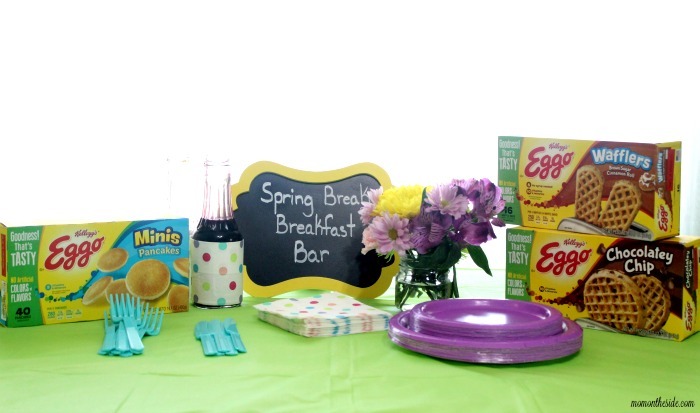 Pin this Spring Break Breakfast Bar for later! Such a cute idea! I love waffles and pancakes and can eat them all day long! Yum and yum! I love the creative idea of the breakfast bar! But I really love looking at the Eggos and the delish toppings you have out! I’m hungry now! I can’t eat these as they are not gluten free but what a fun idea to have a spring breakfast bar. I love that you were creative and made a fait “sandwich” out of the pancakes or waffles too! This is pretty awesome! I really love breakfast food and it’s a great idea to serve it in a bar like this! The waffles look yummy! Yum, my children would be so excited if I did this for them! I would too, actually. I love this! 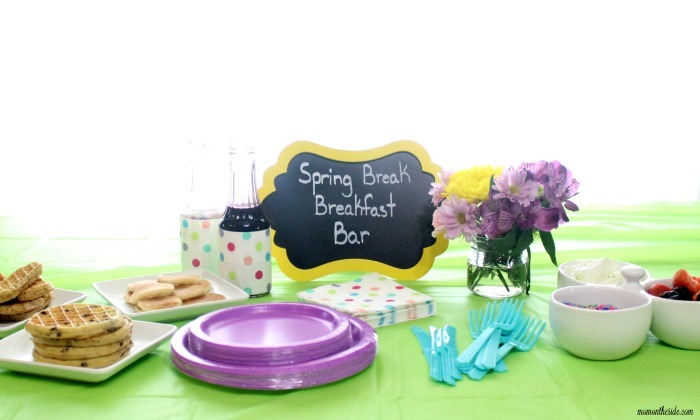 How fun to wake up to Spring Break and have a breakfast bar! I love breakfast, this would make my day! That looks very delicious and very hearty! I would love to do a breakfast bar like this. We love pancakes and waffles at our house! 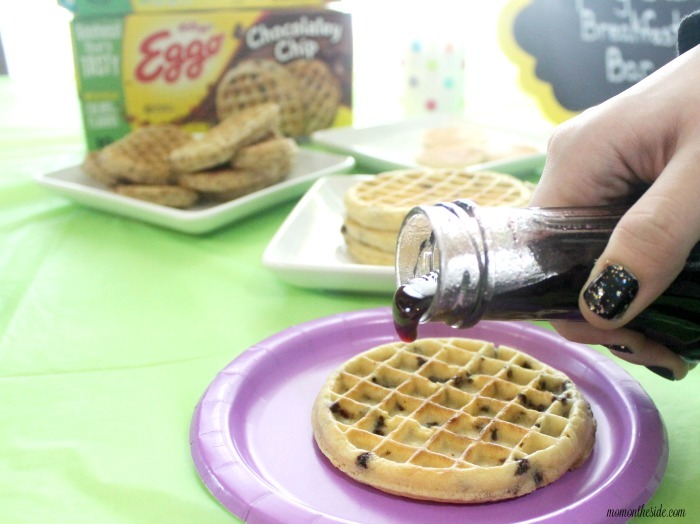 What a yummy way to eat Eggos. Definitely a must have when you have little ones running around. This all looks so yummy and is a perfect idea! My mom used to get me & my siblings a ton of eggos whenever we were on break! We loved them! This is super cute! I might do this for my daughter’s birthday. I think she would like to wake up to something like this. This looks like such a great idea! My boys would love to have a breakfast bar like this. Oh this is my idea of a breakfast bar! Waffles and fruit are a hit in our house. I am so ready for spring… nothing but rain here lately, which we need but I am missing sunshine, and flowers! Eggo has been a staple in my refrigerator. It really helped me with the instant breakfast meals that my family was looking for. Thanks for sharing your own ideas on how this is served! That is such a great idea. I absolutely love it. I don’t have any children but I will definitely be sharing this with my friend’s who do. Eggo waffles are still one of my favorite breakfast foods! I used to eat them straight out of the toaster! Oh what a fun way to wake up in the morning for the kids! 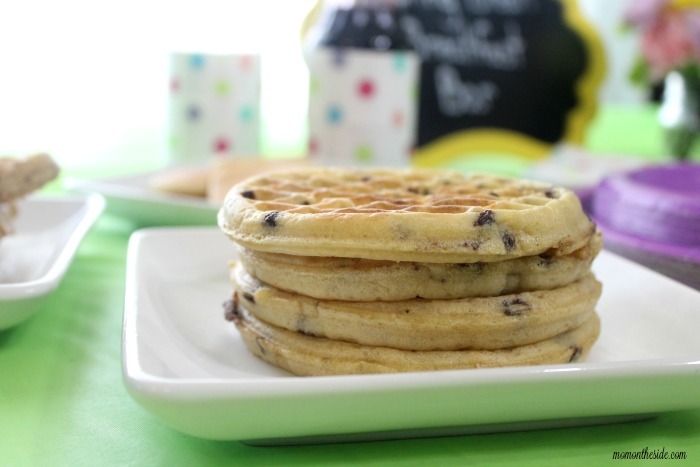 My kids LOVE Eggo Waffles! How fun! What a great way to kick off Spring Break. I know my kiddos would really love this! This is such a cute idea! I love that you have it set up for each person to get their own and you don’t have to help! We are experiencing 60-degree days in Upstate NY…I have been feeling spring fever for the past couple of days. I love your idea of a spring breakfast bar. Now, I am in the mood for waffles.